OUR CHURCH, Toronto Chinese Baptist Church, is our home and sanctuary. It is a place of worship and fellowship. Though we the people are what makes our church part of the body of Christ, our church building also deserves consideration. Our church was built with love and care, and with the desire to create something that would reflect our purpose as God’s people. Unlike many large cathedrals in downtown Toronto, the facade of Toronto Chinese Baptist Church seen from Beverly St. seems modest in comparison, yet at the same time its understated appearance fits its both its purpose and local surroundings. Our church was commissioned by William McMaster who attended Jarvis Street Baptist Church, and donated the land and finances for this intended missions church to be built upon. The Sanctuary of the church was first built in 1880, while the rest of the church was completed in 1886. Like many other Protestant churches, our church places little emphasis on religious and symbolic decoration, as seen by our simple exterior. Instead, the building’s intent is to welcome people into its main doors and to create a sense of community. Our environment is important to us, as our church is located right next to a residential community, somewhat sandwiched in the middle of the hustle and bustle of Chinatown, the class and history of the Art Gallery of Ontario on Dundas Street, and the excitement and eclectic styles of Queen Street. As we enter the church from the main double doors at Beverley Street, we immediately face two different entrances into the lower sanctuary on both our left and our right, along with two stairwells that lead to the balcony above. As we enter the sanctuary, the two lower aisles lead our focus to the pulpit and the church theme written behind the choir pews on the west wall. The west wall, with its grand organ pipes emphasize the actual height and space of the room that is hidden from the outside. The two aisles not only create a great sense of unity, but reflect upon the intentions of the structure as it truly conveys the idea of worship and fellowship with one another in unity. By looking at the floor plan of the church, we can see that the seats are arranged in an amphitheatre style, like the Jarvis Street Baptist Church, to allow for maximum capacity and to emphasize the church’s original missionary purpose. 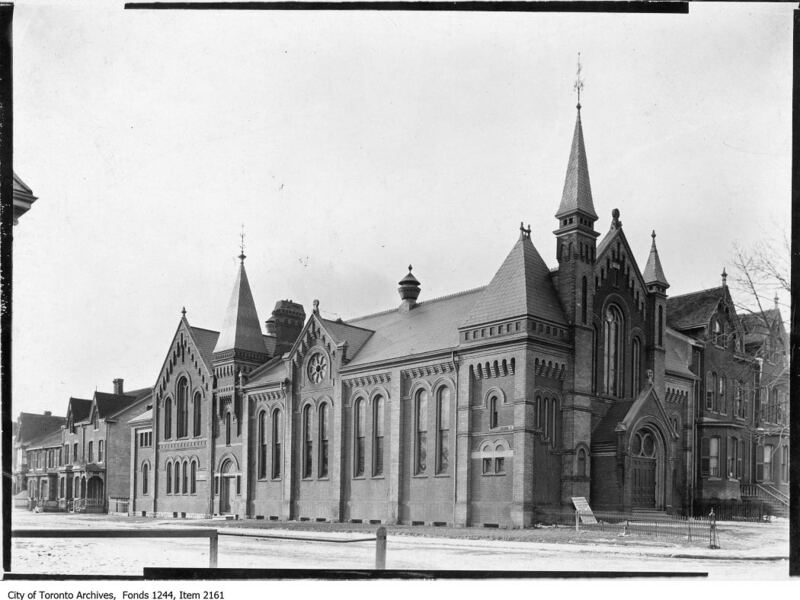 Toronto Chinese Baptist Church was not built to be a showcase of human ingenuity, but a symbol of our dedication to God’s work and a proclamation of our sincere love. CHAPTER CXXVIIBEVERLEY STREET BAPTISTLarge and Useful Congregations – Its History and Its Pastors.